Maalox is an over the counter medication available to all patients, so it is typically safe for most people to use. However, side effects may be experienced, the most of which are common. Serious side effects are rare, but they can include irregular heartbeat, deep sleep, and confusion. Patients should weigh these potential Maalox side effects against the benefits of the medication before using this product. The magnesium found within Maalox can cause diarrhea. By using an antacid that only contains aluminum along with Maalox, the chances of getting diarrhea are lessened. In addition the aluminum found in this product can cause constipation, and in order to minimize this, users should be sure to drink plenty of fluids and get significant amounts of regular exercise. The U.S. Food and Drug Administration has warned consumers about the potential for serious side effects when they accidently use Maalox Total Relief instead of other Maalox products. These products contain different active ingredients and are intended to relieve different symptoms, and they are not interchangeable. Maalox Total Relief is an anti-diarrhea and upset stomach reliever medication, while other Maalox products are antacids. Maalox Total Relief is not appropriate for people with a history of bleeding disorders or gastrointestinal ulcers. Additionally, drug interactions may be more severe with Maalox Total Relief. 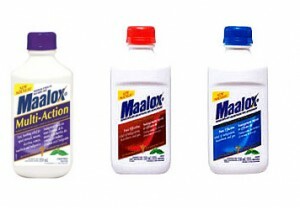 Maalox is relatively safe for children to use, and the brand also creates and markets a variety especially for children. However, some side effects have been noted with this type of medication. Rebound hyperacidity has been associated with Maalox in children due to the calcium salt antacids. This is due to a specific action of calcium, and rare cases of calcium carbonate gallstones have also been reported in children and pediatric literature. Metabolic side effects have also been experienced or exhibited in children, and this has included hypophosphatemia and hypercallcemia. Renal side effects have included formation of renal calcium and renal failure. Side effects associated with Maalox can range from the common to serious, and previous medical conditions and medications can play a part in determining if any side effects are experienced. It is important to discuss possible medication interactions with your doctor. In addition, any serious side effects that are experienced should result in a trip to the doctor to obtain medical treatment immediately.